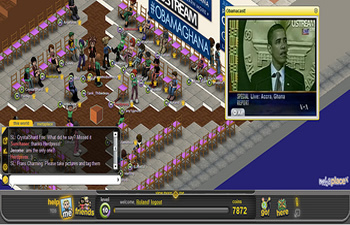 Avatars in Metaplace watching and discussing president Barack Obama's visit to Ghana. In my previous post, I talked about the browser-based virtual environment Metaplace, which I think may provide a way to boost interaction with our community on newspaper website Mediafin. To test how well virtual worlds could be used to build a community, I undertook some experiments in organizing “conferences” in worlds like Metaplace and Second Life. And the results turned out to be quite promising. How can we at newspaper websites experiment with new media without upsetting the community or — possibly even more — our colleagues? Virtual environments are not yet universally accepted as useful for newspaper communities, so the question of how to introduce community and colleagues to these spaces is especially pertinent. To avoid too much controversy or possible embarrassing failures, I use my personal blog, MixedRealities, to test ideas before bringing them to the Mediafin newspaper sites. My blog deals with the intersection of virtual worlds, business and philosophy and is not linked with the newspaper sites. If experiments on that blog work out well, I often introduce them on the newspaper site’s financial blog. If things really succeed, we can promote them more heavily on the site and in the print newspaper. A blog often fosters community. Even a small personal blog can attract people with similar interests, who can leave comments or contact the author via Twitter, Facebook or email. A month ago, I decided to invite people interested in business, philosophy and virtual worlds to a series of informal, small-scale, salon-like meetings in the virtual world Second Life. A friend and I built a virtual headquarters, where avatars can meet at a small square featuring a steam-punk coffee apparatus and also a cinema. During those first meetings in Second Life, we watched short videos featuring, for instance, Clay Shirky speaking about Twitter, Facebook and cell phones. We discussed the video, and I posted about the meetings on my blog. It is crucial to see virtual environments as being part of vast online social networks. I started a Facebook group to promote my “virtual salon,” and I send my invites out to other Second Life communities that share similar interests like Metanomics. Now something interesting happened. At the time, the political crisis in Iran was escalating. Although one might think that politics would spill over into the virtual world, the political scene in Second Life remained very quiet. I contacted some well-connected people to find out why and whether anything was happening behind the scenes, but without much result. So I decided to organize my bi-weekly meeting about social media and social change around the Iran situation. More than 20 avatars showed up. They provided me with lots of information about not only Iran activism in Second Life, but also about the more general scene of political activism in Second Life. The lesson I learned is applicable outside of Second Life, too. Journalists are often too dependent on press conferences organized by organizations, institutions and companies. There is an alternative: Rather than waiting for a press conference, convene a meeting where you invite experts relevant for your beat. Do this on a regular basis. Think of it almost as a reverse press conference. If it is too impractical to do this at a physical location, telepresence techniques could provide a solution. Not very long ago telepresence technology such as videoconferencing was very expensive, but these days there are many cheap or even free alternatives. Second Life is just one of many possibilities. Recently I organized my bi-weekly meeting in another virtual world: Metaplace. For people used to “real 3D” environments such as Second Life or World of Warcraft, Metaplace is a bit of a disappointment, because it is not 3D — but it is pretty immersive, so let’s say that it is 2.5D. Metaplace has some interesting features that set it apart from most other virtual worlds. It is browser-based, meaning that your community members don’t have to download anything to participate. You can either provide a straightforward web address for your world or you can embed your world into your blog. The result is that entering Metaplace gives the impression of just visiting another website rather than opening a new application. Indeed, it is as easy as surfing the web (though it does require registration). But visitors are pleasantly surprised when they find that it’s still a real immersive environment. For example, MixedRealities’ Metaplace space can be reached on http://www.metaplace.com/mixedrealities, or you can find it embedded in a blog post. 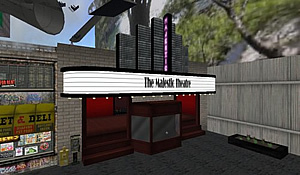 Both Second Life and Metaplace make it possible to integrate video, images and text. Metaplace seems to be easier for accomplishing this — after all, it is situated on the web. Metaplace is much younger than Second Life and the platform is developing fast, although some very interesting features, such as the combination of voice communication (for panel members) and text backchat (for the audience), are still lacking. One could consider Metaplace a graphical chat room with the possibility of easy integration of websites, videos, images and whiteboards. I constructed my “world” in Metaplace as a blogroll or a library that resembled a virtual garden. In the main conference area people can access my blog, other blogs and my FriendFeed, as well as a video about the history of blogging and another video featuring Howard Rheingold explaining what he’s learning from his journalism students. And nearby are a series of videos about business models and virtual communities, the subject of the last meeting. Further down the garden path, people find small collections about new media literacies and about the Obama administration and social media/virtual worlds. The social aspect. As in a library, people discover sites and videos together with other people and they can have a synchronous conversation about what they see. This is especially evident immediately before and after meetings. There is a kind of “virtual water cooler” phenomenon. Some people arrive early, wander around and start browsing the available resources. Others hang around afterward to chat and discover the mini-libraries. The fact that the objects are perceived as objects in a garden makes those experiences different from the classic reading experience. I think that people tend to remember better what they experience by walking around in a 2.5D or 3D environment than what they read on a screen or in print. Because Metaplace is part of the web and so easy to access (something crucial for big newspaper communities), I am considering my virtual “garden office” there more and more to be a part of my blog. I will give my Metaplace world a permanent embedded place on my blog, so people will have easy access to a graphical chat room/library, which can later be linked with other such worlds which share the same interests. The logical next step is to try out Metaplace on our financial blog for the newspaper. There are some issues to be dealt with. For now, my (rather cheap) subscription allows only a concurrency of 50 avatars, which is too low; our weekly text chat sessions on the financial blog get about 300-350 participants. I think it is feasible to have a world allowing higher peak concurrency, but it would be nice to have that offering in a simple commercial package. All being said, Metaplace is still young and founder Raph Koster and his team work incredibly hard and fast at improving the site. Often it is just a matter of suggesting changes and indeed, things get changed! I’d love to hear your take on “reverse press briefings” in physical, web and virtual locations and on using virtual environments such as Metaplace in blogs! Share your thoughts in the comments below. Roland Legrand is in charge of Internet and new media at Mediafin, the publisher of leading Belgian business newspapers De Tijd and L’Echo. He studied applied economics and philosophy. After a brief teaching experience, he became a financial journalist working for the Belgian wire service Belga and subsequently for Mediafin. He works in Brussels, and lives in Antwerp with his wife Liesbeth. One important factor that has prevented the growth of meetings in virtual worlds to date is the limited number of agents (avatars) that can be present at any given time. That’s about to change dramatically. In a few days, a new virtual world – Blue Mars http://www.bluemarsonline.com/ – with a graphics quality that far exceeds Second Life and Metaplace, will be coming out of private Beta. It will make a difference because a thousand of people will be able to attend the same event. At the same time. In the same place. However, the early version will not include voice and people will be communicating in-world via text or simultaneously off-world via Skype. This should change shortly. One presenter will be able to stream a voice presentation, though. Coordinating a meeting that size is costly and time consuming in a non-virtual environment. Coordinating an international meeting in real time of that size is extremely costly. Finally, in virtual worlds, you can coordinate a meeting in a matter of minutes, right when the news is hitting and could use some discussion. Thanks Bettina, I am looking forward to the launch of Blue Mars. However, I guess a download will be necessary, and there are rather specific technical requirements for that environment. Metaplace is (much) less impressive on the graphical side, but it is just an url on the web, so access is very easy… That, for my newspaper, is an important consideration. Roland, first of all: excellent post, as always. Lots of food for thought, even for non-journalists like me. RE Metaplace however, which I also use to some extent, I see few things which can’t be done in Second Life, something I know you basically agree with. Many IT departments are still reluctant to open the gates for Second Life, which I think has less to do with security issues than with keeping employees away from virtual social environments (which I can also understand to some extent). A clear advantage of Second Life imo however is, that newspapers may be able to reach a wider audience there. It is a huge world, with lots of communities, some of which may be quite interested in learning what your newspapers and websites have to say as well. What I mean is that the incentive of having a presence in one world or another, or even several at the same time, may also be partly dictated by where all your possible audiences are. @Bettina: I agree on all accounts Bettina. But as Roland does, I fear that the technical implications at the end of the user, may even be higher than what it is/was for Second Life. Having said that, I can’t wait to have a close look at Blue Mars.